In the early years of the Australian colonies suspicion surrounded Freemasonry partly because meetings were held in private and also because the main population consisted of petty criminals and political prisoners. Understandably the authorities were suspicious of known criminals holding secret meetings. In 1799 The Unlawful Societies Act came into force in Britain suppressing Masonic activity especially private meetings, and the Governor of NSW enforced the Act by suppressing Masonic activity in Sydney (Num par.6). In 1816 the first Masonic lodge formed in Australia, it was the Lodge of Social and Military Virtues No. 227 formed in Sydney in 1816. It had been attached to the 46th Foot Regiment since 1752 and was affiliated with the Grand Lodge of Ireland. Two more Irish Lodges followed: the Australian Social Lodge, dedicated in 1820, and the Leinster Lodge dedicated in 1824. In 1828 Lodge No. 820 Australia was erected by the Grand Lodge of England. All of these Lodges met in Sydney (Gould 388). Num, Bro. Richard W. "Freemasonry in Australia." Pietre-Stones Review of Freemasonry. Web. 10 May 2013. http://www.freemasons-freemasonry.com/freemasonry_australia.html. 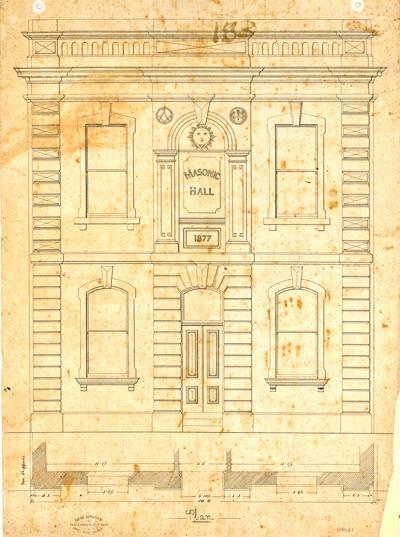 Architectural drawing of the Masonic Hall in West Maitland, prepared by John W. Pender. 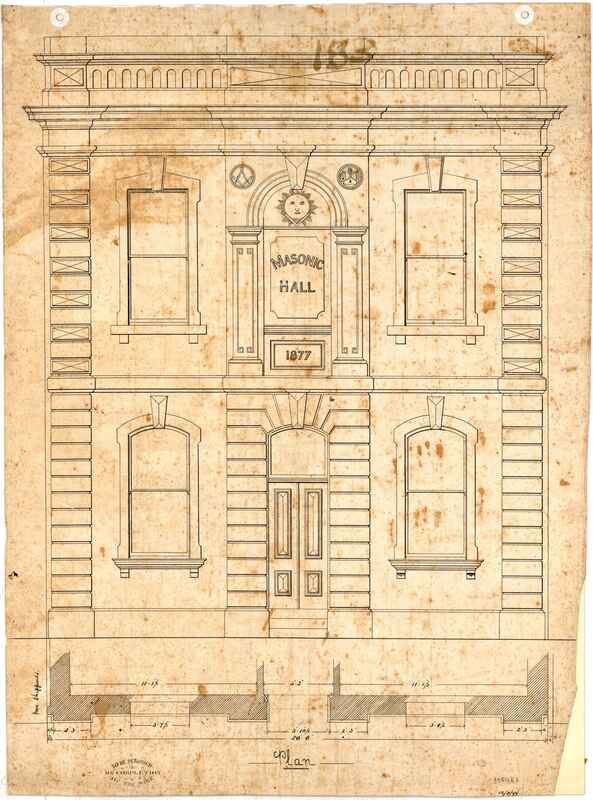 The plan consists of the front elevation and ground plan of the facade for the Masonic Hall in West Maitland. Click image to see the full-sized drawing.